By Sean Jones: Tim Bradley says he was surprised that Gennady Golovkin threw only eight body shots the entire fight against Saul Canelo Alvarez (49-1-2, 34 KOs) last September in Las Vegas, Nevada. Bradley says that was a mistake on GGG’s part, and his trainer Abel Sanchez should have had him make corrections during the fight. Bradley says he still had Golovkin (37-0-1, 33 KOs) winning the decision even with him not fighting the way he should have, but it could have been so much easier if he’s gone to Canelo’s body and been less hesitant to let his hands go in the fight. Canelo will be fighting Golovkin in a rematch on May 5 at the T-Mobile Arena in Las Vegas, Nevada. This fight is supposed to prove who the better fighter is of the two. I don’t know if it will or won’t. It’ll depend on the judging for the fight if it goes to the scorecards. “What do you believe? Honestly, it’s your opinion,” Bradley said to Fighthub about Canelo testing positive for clenbuterol. “The news is out about that whole thing. It’s your opinion. Me as a fighter, I would say, ‘that’s bull—[expletive]. That’s wrong. What can you say? The fight’s still going on,” Bradley said. Bradley isn’t shy about letting the boxing fans know that if he were the one fighting Canelo, he’d very angry at learning that he had tested positive for clenbuterol. The fight is still going on. Golovkin (37-0-1, 33 KOs) isn’t going to stop it, because he already had to wait two years to get the first fight with Canelo. If Golovkin makes a big production about Canelo’s clenbuterol test, he might be jeopardizing his chances of getting a second fight with him. The last thing Golovkin needs is for Canelo to get upset and put him on ice for another two years. Canelo would be hurting himself in the process by doing that, but he seems more than willing to walk away or delay big fights from happening if he’s not ready to take them. ”Gennady didn’t fight to the best of his ability, I don’t think,” Bradley said of the Canelo-GGG fight last September. ”Gennady landed eight body shots the whole fight. He didn’t fight to the best of his ability. The guy [Canelo] stayed on the ropes, bobbing and weaving and dodging, but he was afraid to come back with combinations. When he [Canelo] did, it was beautiful, but most of the time, he was afraid to come back with something, because he didn’t want to be clipped and countered,” Bradley said. Golovkin didn’t take advantage of Canelo fighting on the ropes. Triple G was standing in front of Canelo, throwing jabs and looking like he didn’t want to attack him. Canelo would shake his head after Golovkin would hit him hard. Golovkin looked like he believed Canelo, and he wouldn’t he wouldn’t attack him. If Golovkin had his head wired correctly, he would have attacked Canelo and made him pay just like Floyd Mayweather Jr. did in his one-sided victory over the Mexican fighter in 2013. Mayweather didn’t buy into Canelo’s head-shaking tricks. Mayweather just kept hitting him because he understood what Canelo was doing. He knew that Canelo was faking. Golovkin didn’t know that, and he ended up giving Canelo too much respect. Bradley commented on Golovkin not having fought the best fight possible after the interviewer stated that he can’t see Golovkin improving in the rematch the way he Canelo can. Bradley immediately disagreed, pointing out that Golovkin only threw 8 body shots the entire first fight, and that he hadn’t attacked Canelo in the way he normally had in his other fights. Bradley sees tons of improvement GGG can make I the rematch if he’s willing to take some risks and put in the effort to get better. ”I thought Gennady fought a little bit hesitant, especially when he had him at close quarters,” Bradley said. ”When you’ve got firepower like that, you hit a guy on the elbows. You hit a guy on the shoulders, everywhere. It’s going to hurt. The energy going into him, it’s going to hurt him [Canelo]. It’s going to bring his hands down. Going to the body is going to bring his hands down. Just paw, paw, pawing,” Bradley said about how Golovkin chose to fight Canelo. I don’t think Golovkin realizes how hard he hits. He doesn’t take advantage of his own punching power by attacking his opponents enough. He fights like he wants to box hem instead of slugging it out with them and this allows them to survive longer than they should have. Canelo probably wouldn’t have seen the 12 rounds if Golovkin had attacked him in an all-out manner the way he needed to. Bradley should have been the guy in Golovkin’s corner in the first fight with Canelo, as he would have let him know that he needed to throw punches anywhere he could. Golovkin was too intent on throwing head shots. That was the only thing that he seemed to know how to do. He says he used the Mexican style, but he clearly doesn’t know how to fight like that. Golovkin has always been a head hunter in his fights. The two fights in Golovkin’s career in which he threw body shots was against Matthew Macklin and Gregorz Proksa. Those two fights stood out for Golovkin with him using the Mexican style. In all Golovkin’s fights since the Macklin contest, he’s been strictly a head hunter. ”You can give Canelo credit for his defense, but behind that defense, you’ve got to have offense,” Bradley said. ”He was rolling his head to get away from. It was beautiful, but now you’ve got to come back with something. The thing for me is we’ve seen Canelo his whole career. He’s never been able to hold a hot pace that high, especially when he’s getting pressed like that. He’s never been able to hold that pace. That’s why he likes to hang on the ropes. He likes to rest. That’s why he likes to play defense, because he knows he don’t have to do no work,” Bradley said. Canelo was playing pure counter puncher against Golovkin. He couldn’t do anything at all when Golovkin was jabbing him from the outside. That’s the reason why Canelo would bail and go to his left, because he was picked apart by Golovkin’s jabs, and he couldn’t reach him due to his arms being too short. ”I don’t see anything different the second time around,” Bradley said of the Canelo vs. GGG rematch. ”I see the same thing. I see the same type of fight from Canelo. I see the same type of fight from Canelo, because that’s all we’ve seen of Canelo. That’s all we’ve seen,” Bradley said of Canelo. It’s got to be the same fight. Canelo isn’t going to grow taller. His arms going to get longer by the time they fight a second time in May. Canelo’s stamina is not going to improve, no matter what he’s using or not using. The stamina problem that Canelo has is here to stay forever. It’s not going to improve. I come from a track background, and I’ve seen tons of different guys on my track teams that were built just like Canelo, and none of could run more than a lap without gassing out and being useless. We couldn’t use those guys for sprinting or any longer runs. We always had them throwing the shot put or the javelin. There was no stamina at all with those guys, and Canelo is built just like them. Let’s be real. Canelo’s stamina is bad and it’s going to stay bad for the second GGG fight. If they fight each other 100 times, Canelo is going to be gassing out after the first 45 seconds of every round just like he did in the first fight, and there’s nothing you can do about it. Canelo go up in the hills of Colorado and try and improve his stamina with high altitude training. I think that’s a total of waste of time. He’s not going to his stamina no matter what he does. It’s a limitation that he’ll always have. Canelo just has to work with the flaws that he has. He still has excellent hand speed for a guy built the way he is, and he’s got good defensive skills. His power is good as well for certain punches like his uppercut. But if Golovkin pushes a fast pace against Canelo on May 5th, and if he doesn’t let him run to the left, it’s going to be a real nightmare for the redheaded Mexican fighter. He has absolutely has to run for him to have a chance to catch his breath and restore the oxygen in muscles and upper body. When that lactic acid starts to build up in Canelo’s body from being pushed to a fast pace by Golovkin, he’ll have to run or else he’s going to get knocked out. Canelo’s trainers Chepo and Eddy Reynoso are smart. They’ll have realized by now that Canelo won’t be able to run to his left or even to his fight against GGG in the rematch. They understand obviously how terrible Canelo’s stamina is. They likely talk about it amongst themselves, but not with Canelo. So instead of them telling Canelo to run from GGG to try and recover, they’re likely going to have him use clinching to get badly needed rest breaks. That’s the only thing Canelo can do. If you take away his ability to run from Golovkin, you’re left with him only having one choice that’s to clinch. Canelo surely won’t stand and try and fight it out for a full three minute round, because he doesn’t have the stamina to do that. Believe me, if Golovkin presses Canelo hard for a full three minute round, he’s going to have him on the verge of a knockout in the first 3 rounds if he goes to the body and doesn’t let him rest. I think Golovkin will hurt Canelo in the first three rounds the same way James Kirkland did in their fight in 2015. The difference is Golovkin won’t get taken out by one of Canelo’s uppercuts the way Kirkland did. ”He’s going to have to train on the moon to get a bigger gas tank,” Bradley said of Canelo. ”I think the jab of Gennady is what breaks the timing of Canelo. He keeps landing that jab on the forehead or split that guard. Canelo is going to have a hard time countering Golovkin. And if Golovkin goes down to that body and wears him down to the body, because you already know wherever Canelo goes, Golovkin is going to be there,” Bradley said. Canelo’s stamina is going to be there in the rematch with GGG no matter what. If Canelo was using clenbuterol to help his conditioning problem, like some boxing fans think he did, it’s not likely to help him more than a very, very small amount of it all. Canelo’s stamina problems are so big that they are not going to be fixed with a PED like clenbuterol. Canelo has a serious cardio problem that is beyond fixing. It’s going to be there his entire career, and it’ll only get worse as he gets older. Golden Boy will need get good at matching Canelo as he gets older, into his 30s, because he’s going to gas out against a lot of guys and wind up being put in the same position he was in last time against GGG, but even worse. If the judges aren’t going to keep scoring the rounds based on the first minute of action and ignoring Canelo gassing out and getting worked over in the last 2 minutes of each round, then he’s going to lose a lot of fights. Canelo has to be able to fight hard for a full 12 round fight for him to win. ”You can’t sustain that high pace of a fight, especially when a guy can punch that hard and every time he hits, he’s draining you,” Bradley said about Golovkin’s pressure and power wearing Canelo out. ”Plus, every time you fire those shots, you can possibly get clipped with something in between. There are a lot of top fighters that can punch with you when you punch. These top fighters punch when you punch, and punch in between shots. Golovkin can do that, and if he lands something hard on Canelo, he can be hurt,” Bradley said. Golovkin must set a fast pace in the rematch and do that from the very start of the fight. 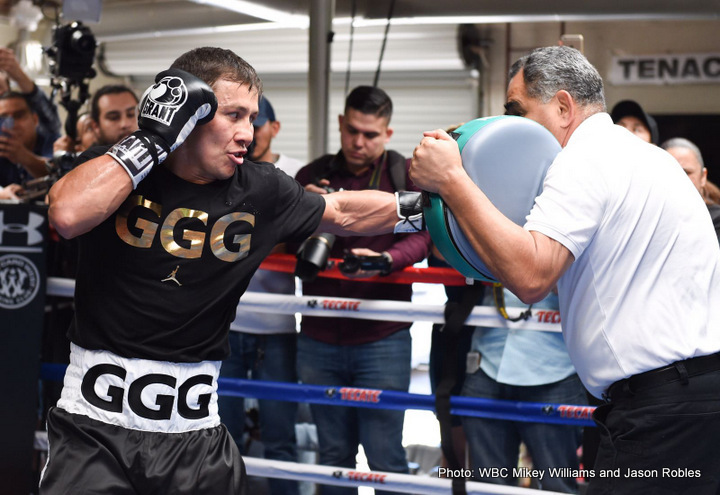 It’s not going to work for GGG if he waits until round 3 before he starts attacking Canelo. Golovkin can’t give away rounds like he did last time. Some boxing fans even think that Golovkin gave away round 3 as well. I’m not one of them. I had Golovkin winning round 3 after losing the first two rounds. In the last three rounds, I had Golovkin winning the 10th and 11th, and then losing the 12th. I’ve watched those rounds a number of times, and Canelo simply didn’t do enough in the 10th and 11th to win them. He fought hard initially at the start of the rounds, and then got tired and ran and rested against the ropes. The boxing fans that gave Canelo the last three rounds scored the rounds based on the action in the first minute, and then they ignored Golovkin dominating the last two minutes of those rounds. ”I was surprised in the first fight how well Canelo took his punches,” Bradley said. ”I was surprised. He took them well. He took like nothing. I’m just worried about the pace, and the gas tank, and whether he can put out more punches than he did in the first fight. That’s going to be tough, tough, tough to do, especially against a guy that comes forward and pretty much fights the same way every time,” Bradley said. The main reason why Golovkin’s head shots didn’t hurt Canelo is because he wasn’t putting everything he had into the shots. Golovkin was missing with so many of his power shots that he had to decrease the power on his punches in order to land to Canelo’s head. If Golovkin had simply targeted Canelo’s body, he would have had much more success. Canelo turns sideways when body shots are thrown at him, but they still land on his hips and sides. That’s where Golovkin will have to target his punches, because it’s a waste of time for him to sit and wait for the perfect opening for him to land. It was taking Golovkin too long to land his shots last September, and that caused him to miss out on a lot of great opportunities to hurt Canelo. ”You’ve got a Mexican trainer, man,” Bradley said of Golovkin’s trainer Abel Sanchez. ”You go eight times to the body? Come on, man. I’m sitting there screaming, ‘You’ve got to be kidding me, eight times to the body? Hit him to the body, especially when he’s backed up against the ropes. Hit him to the body.’ This is why I’m telling you, they setup by having a third opportunity, and that’s what I’ve been talking about. So now you go to the body. You know he’s countering. Be ready for that counter,” Bradley said of Canelo likely looking to counter Golovkin after he throws to the body. ”That’s what I’m talking about. You’ve got to be 2, 3 steps ahead of him. You throw a left hook to the body. Guess what? The right uppercut could come. Be aware of that. Know that already going in when you dig down to the body. So guess what? Boom and double it. Book or fake high and tap high and dig down to the body,” Bradley said in explaining tips Golovkin should use to defeat Canelo. “Get that head at home, and get that head high, and the go down to that body. There are little things you can do, man, especially when you’ve got guys against the ropes like that. Instead of just sitting in front of him and not doing anything at all,” Bradley said. Bradley is completely right about Golovkin needing to throw o the body in the rematch. He’s not going to be able to beat Canelo standing on the outside jabbing. It’s already been established that the judges in Vegas are not going to give Golovkin the decision by him picking the highly popular Canelo apart. GGG has got to do more by attacking Canelo, and making sure that he wears him down. Throwing to the body makes the most sense, because Canelo is good at moving his upper body to make the head shots either miss or fail to land with enough force to do anything to Canelo. ”I’m picking Gennady Golovkin. It’s going to be a decision,” Bradley said of the Canelo vs. Gennady 2 rematch. ”I did have Golovkin winning the first one. But like I said, everyone is picking Canelo. I get it. I’m going with Gennady Golovkin. I’m going with Golovkin, and I think it’s going to be close to the same fight, but I think he’s going to do a little bit more when he has a chance to [attack Canelo]. That’s my pick, man. Anything is possible in boxing, but I doubt that. I doubt that he’ll KO. Canelo has got to the body. If he doesn’t go to the body, then how is he going to slow this bull down? You’ve got to go to the body. That’s how you slow down pressure. Really, go down to the body. Throw the jab to the chest. That slows down pressure. Hit him to the body. That slows down pressure. It don’t stop it, but it slows it down, and plus, it takes power away from the guy,” Bradley said. Golovkin learned from the last fight that he A. can’t start slowly. B. He’s got to throw body shots to win. He can’t just head hunt. C. Jabbing Canelo from the outside won’t help him get a decision. It was good enough for the highly popular Floyd Mayweather to be given a decision, but it won’t work for GGG. He needs to give Canelo a beating for him to have a chance of getting a decision. If the second fight plays out just like the first one, as Bradley says it will, then it’s clear that Golovkin will do more than enough to deserve the win. Now whether the judges give the 36-year-old Golovkin the victory is another thing all together. This is Canelo’s hand-picked venue, and it’s his boxing fans that will likely be the dominant force inside the T-Mobile Arena. If the fight plays out like last time, and there’s no reason to think that it won’t, then Golovkin will do enough to win the fight 9 rounds to 3 just like last time. But the fight is taking place in Nevada, and the judges might not pick against Canelo. He means a lot to the city.